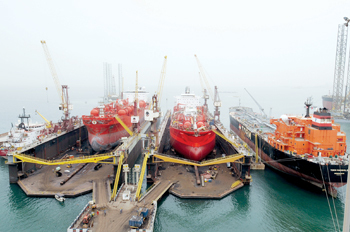 Asry, a leading regional ship and rig repair yard located in Bahrain, has received certification from the American Bureau of Shipping (ABS) for tailshaft cladding and welding. This follows a survey ABS carried out in June of the shipyard’s facilities and associated quality procedures. Asry said the certification affirms that tailshaft repairs done by it are carried out in accordance with the standards and rules of ABS, which is one of the leading global classification societies for quality assurance in marine-related facilities. Adel Boutari, the yard’s health, safety, security, environment and quality senior manager, said tailshafts were a top priority for shipowners and the certification meant Asry had the requisite capabilities. He added that Asry was one of the first in the Middle East to acquire the technology and expertise required to attain the certification. In other Asry news, the company has been shortlisted for two awards at the Lloyds List Middle East and Indian Subcontinent Awards 2015 including the Shipyard of the Year category and the Safety category. Winners will be announced in Dubai this month. Asry chief executive Nils Kristian Berge said the yard has received four nominations – two from Lloyds List and two from Seatrade Maritime Awards. Lloyds List deputy editor Craig Eason said growth in Middle East countries and the huge potential of the Indian Subcontinent made the awards one of the most exciting in the calendar. A number of Russian marine companies have been pre-qualified by Asry following a visit to St Petersburg in Russia by a Bahrain delegation. It was led by Capital Governor Sheikh Hisham bin Abdulrahman Al Khalifa. Asry was represented by procurement and contracts general manager Magdy Abd Elghany. The Russian companies that stand to benefit include Krylov State Research Centre, Almaz Shipbuilding Company, Sredne-Nevskiy Shipyard, Meridian Research & Production, JSC Compressor and the Kronstadt Group.